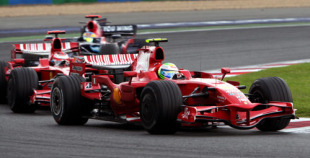 Ferrari hit back in France with a one-two finish at Magny-Cours - but it was Felipe Massa, rather than the anticipated Kimi Raikkonen, who took the win. Raikkonen led the early stages but by lap 30 he was losing time and his Ferrari engine sounded rough. Massa was closing fast and by lap 39 took the lead. Raikkonen's Ferrari had an exhaust problem which overheated and burnt a hole in the bodywork. As it overheated, the exhaust issue also affected other settings on the car which caused it to go slower and the Finn dropped away from his team-mate. An ecstatic third was Jarno Trulli, his Toyota rounding out the podium finishers just a week after the death of former Toyota motor sport boss Ove Andersson, killed in a classic car rally. His third place was well-deserved, though, as he had to make the car as wide as he could to fend off Heikki Kovalainen who tried everything he knew to unsettle the Toyota over the last few laps. No kerb was safe as the Finn darted around to try to pass the Toyota, but Trulli stayed in front. With Robert Kubica fifth, the championship lead swung in favour of Massa, two points clear of Kubica. Ferrari increased their lead in the constructors' battle - 17 points ahead of BMW.